1. Chop the fennel bulbs and slice them into small pieces to make 4 cups. 2. Heat butter in a large pan. 3. Saute the onions for 3 to 4 minutes. 4. Add the potato, chopped fennel and cook for 4 to 5 minutes more, stirring from time to time. 5. Pour the vegetable stock. 8. Cover the pan with a lid and reduce flame to low. 9. Simmer for 25 minutes or until the vegetables are tender. 10. Then grind them all together to a smooth puree. 11. Strain into a medium pan and place over low flame. 12. Add butter and mix well. 13. Gently add the milk and sour cream. 14. Whisk well until well combined. 15. Adjust seasoning if desired and serve hot. 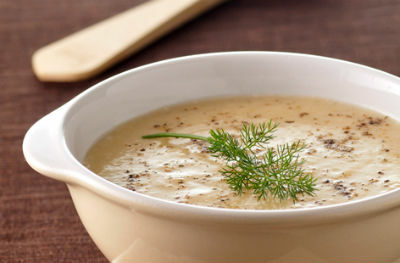 Feel free to comment or share your thoughts on this Cream of Fennel Soup Recipe from Awesome Cuisine.